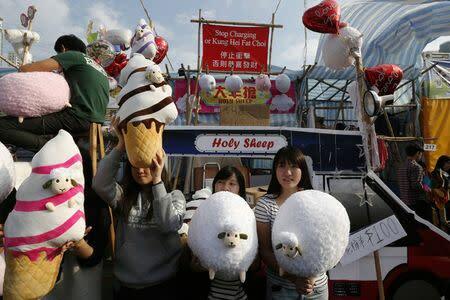 Vendors sell toy sheep inside a Lunar New Year market at Hong Kong's Victoria Park February 17, 2015. HONG KONG (Reuters) - Hong Kong leader C.Y. Leung said on Wednesday residents of the Chinese-controlled city should be more like sheep after a year he said was "rife with differences", including months of sometimes violent pro-democracy street protests. Leung was delivering a Lunar New Year message to mark the Year of the Sheep, or Goat, in the Chinese calendar that is based around 12 animals of the zodiac. "Last year was no easy ride for Hong Kong. Our society was rife with differences and conflicts," he said. "In the coming year, I hope that all people in Hong Kong will take inspiration from the sheep's character and pull together in an accommodating manner to work for Hong Kong's future." He described sheep as "widely seen to be mild and gentle animals living peacefully in groups". Chambers dictionary describes a sheep as "a creature that follows meekly, is at the mercy of the wolf or the shearer and displays tameness of spirit". Chinese officials have repeatedly stressed the need for a harmonious society in the former British colony, which returned to Chinese rule in 1997. Hong Kong returned to China under a "one country, two systems" formula that gives the city more autonomy and freedom than the mainland and a goal of universal suffrage. But Beijing's refusal to grant a fully democratic election for the city's leader in 2017 infuriates pro-democracy activists and politicians who blame Leung for not standing up for their rights.